All Shared Hosting plans have resource limits set by CloudLinux LVE (Lightweight Virtual Environment) - resources include CPU, physical memory, entry processes and number of processes. If your account starts using more resources than your limit, this is resource overuse and you will either see an error message or your website will work slower. 3 codes you are likely to see are 508, 500 or 503. If the limit has been reached by one of the domains, all other domain names hosted in the account will be affected as they share the same resources. Below are steps to find, and resolve resource overuse. Log into your hosting control panel (cPanel) to view your current usage under the Statistics section. Your login details are different to your Namecheap account login and were sent in your Hosting Welcome Guide. If you don’t have this to hand, you can contact customer support who will resend the email to you or reset your password. You can access your cPanel via Namecheap Dashboard and from http://yourdomain.tld/cpanel or https://servername:2083 links. It’s a good idea to monitor your usage regularly and over specific time periods to ensure you can take action if it starts to get close to your limits. 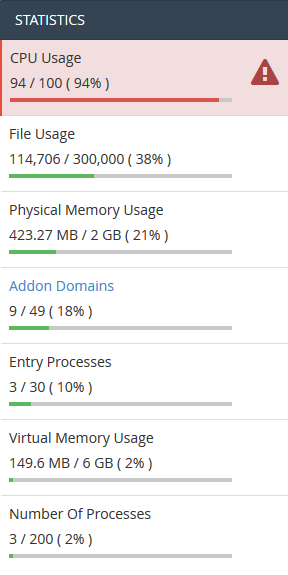 You can do this easily by clicking on the CPU and Concurrent connection Usage menu in your cPanel. Code 508: If you receive this error on your website you can still access cPanel with the servername link https://servername:2083 to disable or modify scripts that cause overuse. Check the running processes at the time of overuse or contact our customer services team who will be happy to do this for you . As its only for a short period we won’t be able to check this for you but do recommend you look at the resource usage over a specific time by clicking on CPU and Concurrent connection Usage via your cPanel. This may give you an indication of what resources are reaching their limits. Step 4: Once you have identified which process are impacting your limit, some of the most common ways to reduce usage can be found in the Troubleshooting section below. If none of these resolve your overuse please contact our customer service team who will be happy to help. If you have access to commands via SSH you can check processes which are currently running with the command top -c. This will enable you to see which process(s) use most of your resources such as CPU and virtual memory. You will also be able to identify the number of tasks and whether these are running, sleeping or have stopped. If the process is generated by a script, the simplest way to disable use of this script is to rename it. Or you can create a Deny from all record in the .htaccess file where the problem script resides. Below is a handy guide to understand in more detail how to run the top -c commands. You can find more details here. The fourth and the fifth lines show memory usage (RAM): total, used, free and buffers. The first row shows physical memory and the second one shows virtual memory (swap) of the server. NOTE: Changes will not take effect immediately. You will need to monitor website performance for about an hour, if nothing changes contact customer support who are available 24/7. • Increases in site traffic: Go to Awstats menu in cPanel. This will provide information about visitors to your site and will enable you to understand if there has been a recent spike in number of visits. If you do notice a growing number of visitors, and are having resource outages, we recommend that you review your current plan or contact customers services who will be able to help. • Optimize your websites (you can use Google PageSpeed Insight for diagnosing). If you are a WordPress user, this article may come in handy. If you are still experiencing resource outage problems, contact our customer support who will help you find and resolve your issues.